Well . . . I promised a little update on the problem solving from the other day, so here goes! 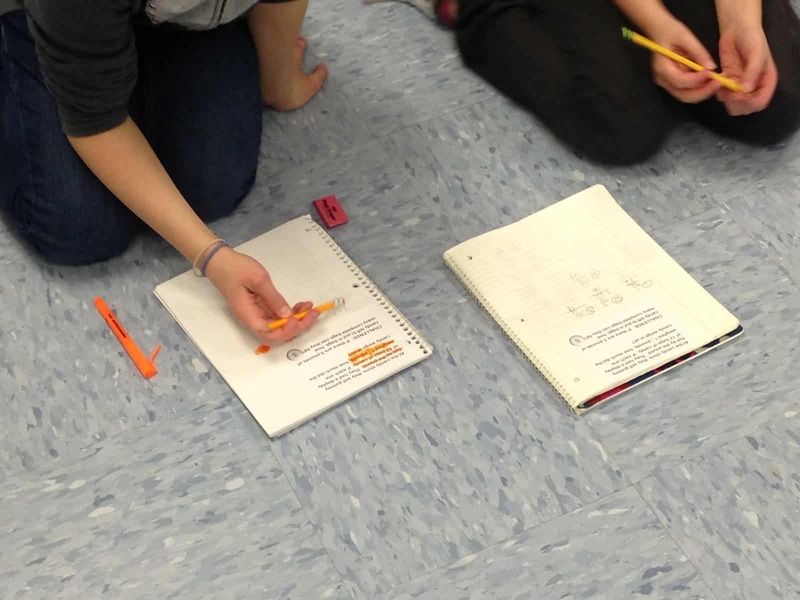 What I often do toward the end of a unit is provide students with a class period or two to work collaboratively or on their own on an assortment of word problems. 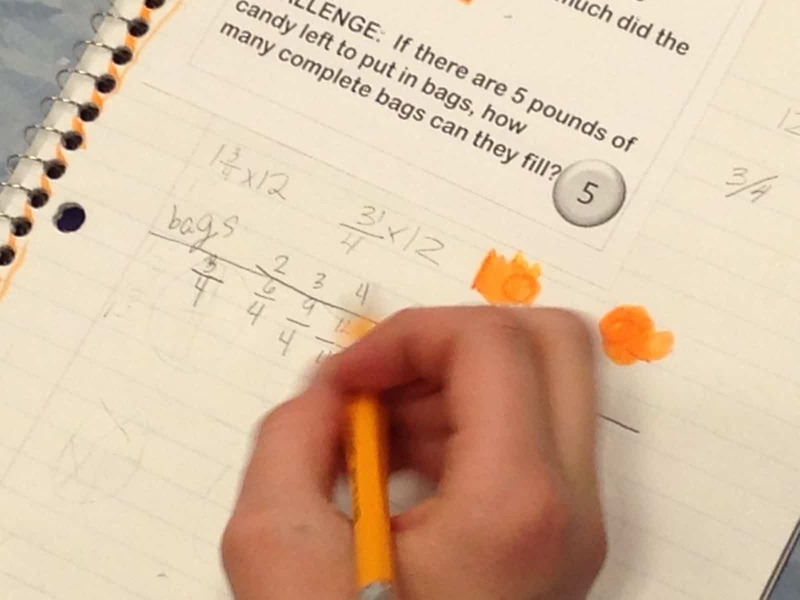 Some of the problems are right at the level I would expect them to be able to do and others “push” and help them work on their “problem attack” and perseverance. While they work, I can circulate and coach as they get started–but then my real goal is to be able to pull small groups and individuals to work on “issues” that have come up in recent lessons. During this round of problem solving, I wanted to pull students who are still “iffy” on equivalent fractions, on comparing fractions, and on addition/subtraction with like denominators, so I got my collection of problems ready so the students would be focused while I pulled groups. This is a little cheap “tent” pocket chart that I think I got a few years ago at “The Bullseye Store” It has those pockets on both sides. So . 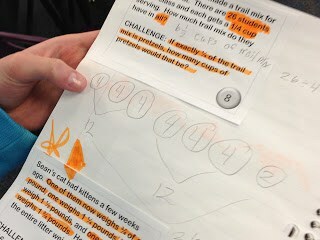 . . on each of my two problem solving days, I did a 15 minute review minilesson to keep cycling back through those concepts covered over the last weeks and then I sent my students off to work in their math notebooks on the variety of problems. I DO give a little “problem talk” about the problems (8 choices this time) so the students know who the problem is about (often students in the class) and what is happening. In this collection there was a friendship bracelet problem (I KNEW which 3 girls would make a beeline for that one), a “travel team” soccer problem, a kitten problem, a candy store problem, a “Training for a 5K” problem . . . you get the picture. 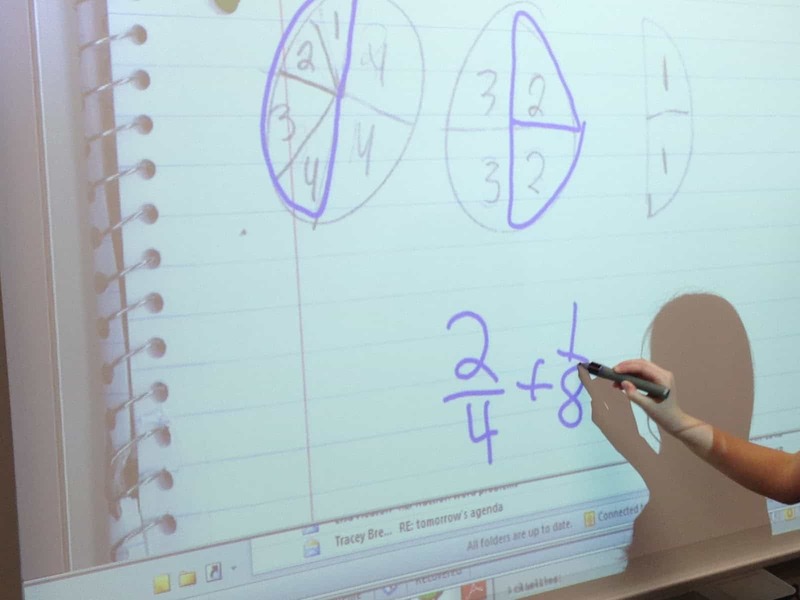 Students often gravitate toward problems with topics that interest them no matter what the math content is! I will also give a warning if I think the problem is particularly challenging or one that I call a good “warm up” which is the sign to those who are hesitant to TRY THAT ONE FIRST! Drawing pictures to solve the problem . . . notice the use of highlighter to highlight key information. This is the first class I have ever had that likes that as a strategy. 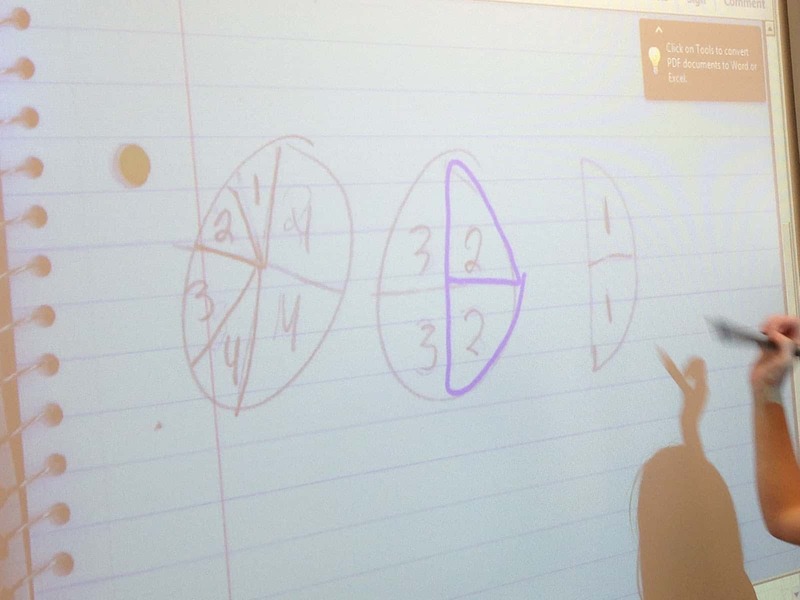 This student tried problem 6 and then decided to abandon it for now . 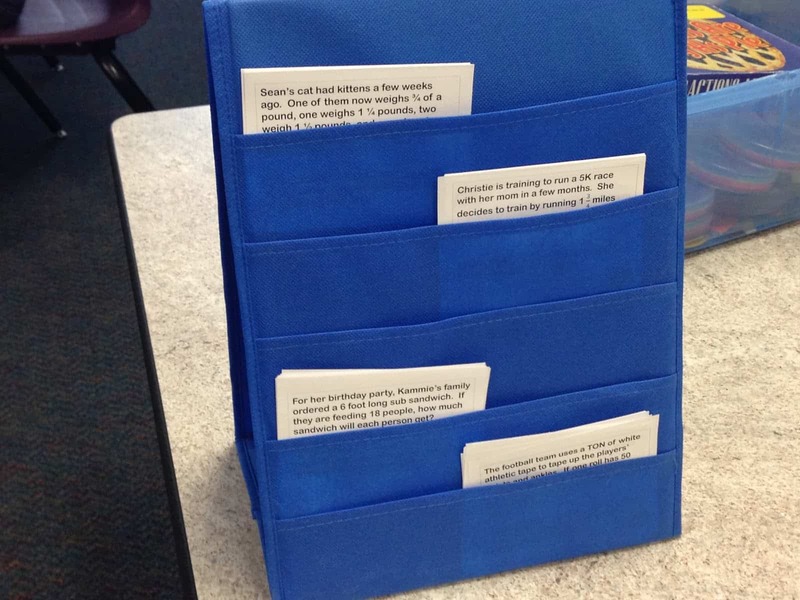 . . we compare abandoning problems to abandoning books. You shouldn’t have to do it very often, but sometimes it is the best decision. 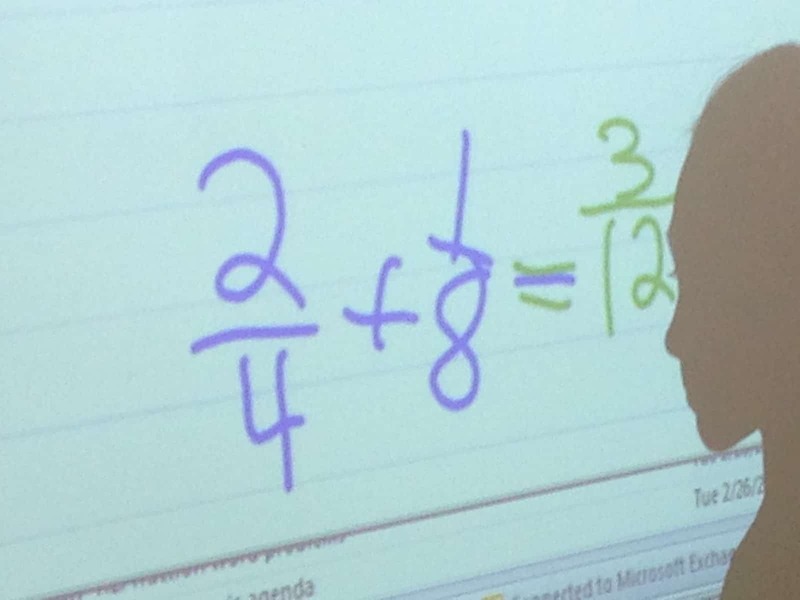 This student was stumped! 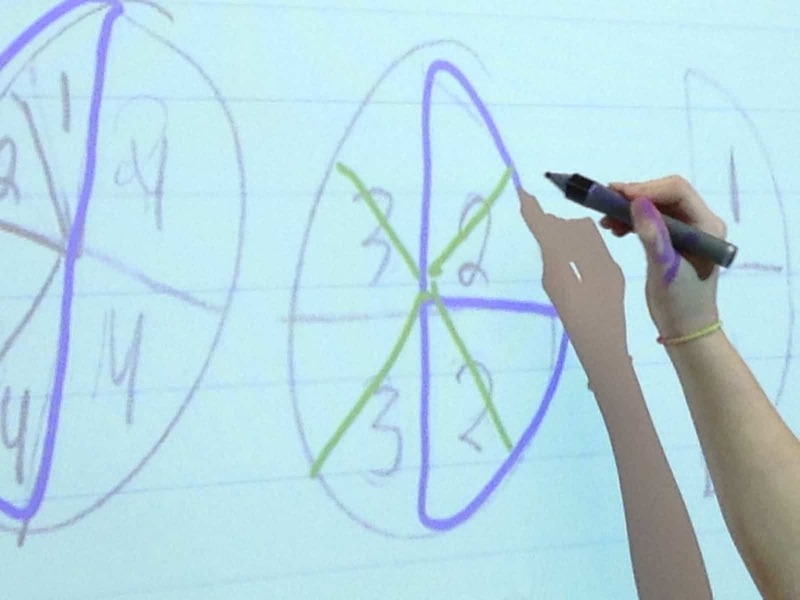 I spent some time talking with her and then found another student doing the same problem . . . 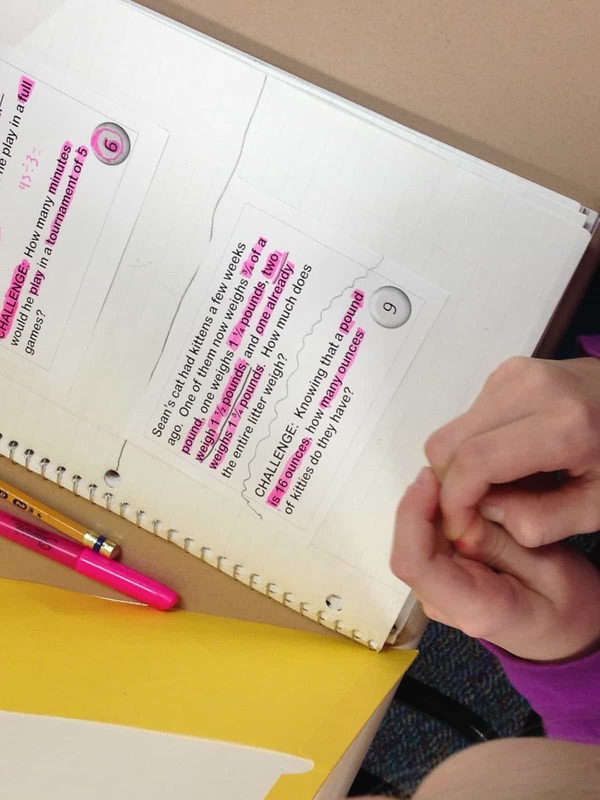 Together they talked through it and came up with two strategies to try–both worked! They were so excited! The one thing that got me super excited during this time . . . I had just finished with a small group when one of my “fraction challenged” students came up to me with a question about her problem. 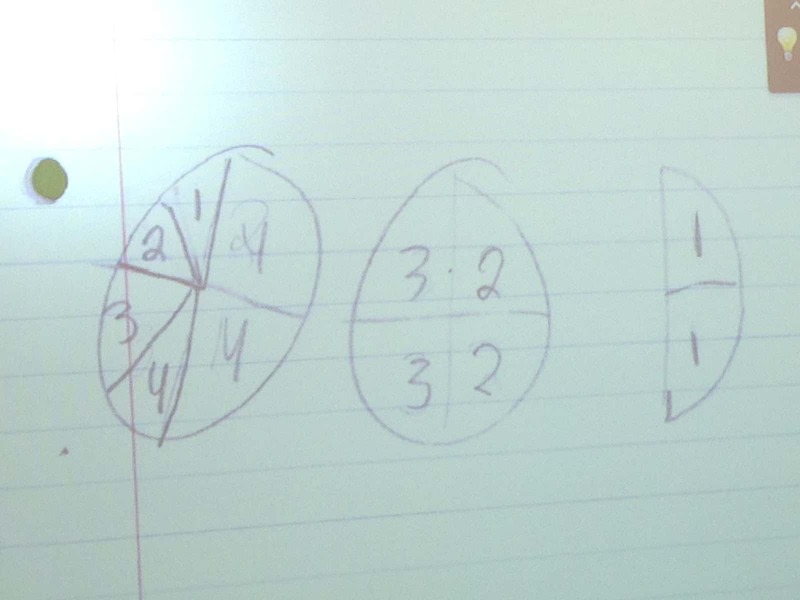 The problem states that Mara and her 3 friends ordered pizza and ate 2 1/2 of them. 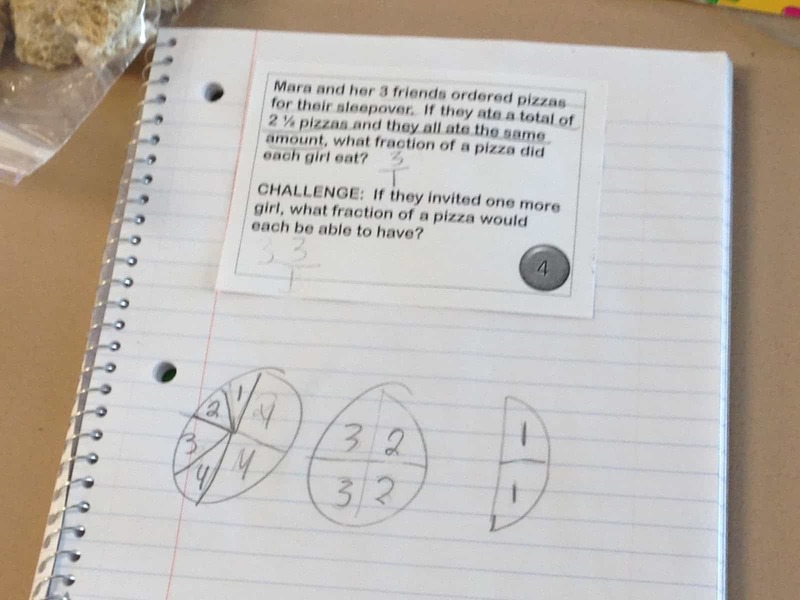 They all ate the same amount–what fraction of a pizza did each girl eat? She had drawn a picture and really felt like she had found a way for each girl to get the same amount–but she had no idea WHAT that amount was. Check out her solution–brilliant, right? She drew the 2 1/2 pizzas, assigned each girl a number (1-4) and started splitting the pizza up. 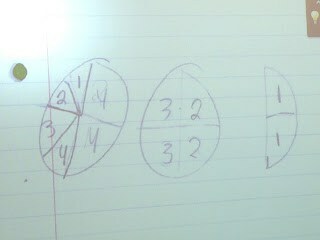 She knew each girl could get 2/4 but they would have to all split the remaining half of a pizza–so she split THAT into 4 pieces. She couldn’t quite figure out how much that added up to be. I sat and listened to her reason through the problem and I noticed several other students starting to hover around (very typical . . . I tell them that smart learners tune in to others’ lessons, so I encourage this!) so I asked if any of them thought they could help. We threw her problem up on the Smartboard. . .
Then asked for volunteers to go up with her and talk through it . 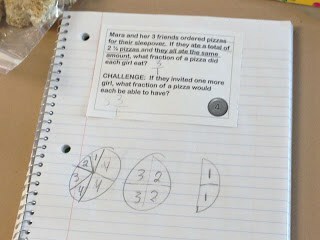 . . this student tried to help her see that each of the girls WOULD get 2/4 of a pizza AND 1/8 of a pizza BUT. . . When it came time to do the math . . .
Something less than perfect happened. I felt my heart sink until I heard another little voice chime in and say . . .
. . . and so she did. She came up and divided all the fourths into eighths and the THREE of them collectively shouted out “FIVE EIGHTHS!”. At this point, 8 students had gathered while the others worked. High fives went around the group and they all rushed back to their notebooks to record their thinking. Thanks for stopping by . . . the unit is coming to a close! Let’s hope they are ready for their assessment on Monday!